William John MUSGROVE (1860 to 1901) was employed in various positions on the new railways, specifically at Paddington by Great Western Railways (GWR). He married a very pregnant Hannah Elizabeth WILD (1866 to 1959) in 1885 and they went on to have a total of 7 sons and just 1 daughter between then and 1900. They lived in the poor area of Kensington in Southam Street. The family photograph you can see was probably taken following William's death in November 1901 during the period of family mourning (although Jack looks older than 15 months ?). William John MUSGROVE or Bill, as he was known, was born 13th May 1885 in Kensington. In 1901 he was described as an "office boy" on the census and by 1911 he had progressed to being "newsagent" (on own account) living with his widowed mother and two youngest brothers, Frank and Jack. He married Mabel BUTLER (born about 1886) in Kensington 1913. They had two children, one of whom became a POW in Japan during WW2. Caroline MUSGROVE was born 19th February 1887 in Kensington. In 1901 she was described as a "eyelet maker" on the census. She married John Alfred AKEHURST in Christchurch, Notting Hill, Kensington on Boxing Day 1908. In 1911 they were living at 41 St Ervans Road, Kensington in 2 rooms including the kitchen (was this where Hannah moved to ?) His occupation on the 1911 census was "printer" and they had three daughters between 1910 and 1916, the youngest of whom was Lena. Lena had three sons and a daughter between 1941 and 1953, the oldest of whom is J. Caroline died aged 84 on 23rd July 1971 in St Charles Hospital, Ladbroke Grove, London and had outlived all her brothers. I remembers being at Aunt Carrie's house when WW2 broke out. Charles Thomas MUSGROVE was born in 1891 in Kensington but sadly died under two years of age of tubercular meningitis and convulsions. Alfred James MUSGROVE or Alf, as he was known, was born Kensington 1893. The 1911 census describes his occupation as "Tailor" serving with The King's Own Yorkshire Light Infantry (KOYLI), 10th Battalion, Hong Kong, South China. He married Francis May STONEMAN on 1st August 1915 at Holy Trinity Church, Hammersmith when his occupation was "Army Private". It is believed he served with the KOYLI during WW1 and died in 1925 (? confirm date). They had a son Alf (who J is still in contact with) who was a Squadron Leader who in 1969 piloted the VC-10 taking Queen Elizabeth to Brazil for a state visit. Alf junior married for the second time in 1978 and went to live in America. Albert Edward MUSGROVE (standing) or Bert, as he was known, was born in Kensington 1895. On the 1911 census he was 15 years old serving at Fort Rownes No 2 Depot Royal Garrison Artilery in Military Road, Alverstoke, Gosport. J's mother took her to see him in a hospital near Kensington where he died of cancer in 1950. Frank Arthur MUSGROVE (seated) was born 1899 in Kensington. He enlisted at Hammersmith and, like his brothers, served with the KOYLI. He was killed in action on 5th October 1917 probably during the Battle of Broodseinde. Alf and Bert enlisted into the KOYLI's in Cork, Ireland. T says her mother told her "the boys ran away from home and joined up together". NB George also ran away ?? George Henry MUSGROVE was born 4th September 1896 in Kensington. He has a fascinating story including being sent to a Workhouse School, running away and joining the Army, earning a DCM in WW1, losing a leg, getting married, serving again in WW2 and then having his two sons predecease him during the War before he died in 1945. His daughter is T.
John William MUSGROVE or Jack, as he was known, was born 5th August 1900 at 27 Southam Street, Kensington. He married Amy McTEAR on 30 October 1925 in Portsmouth. Jack was my birth grandfather. J tells me that Jack used to own an off-licence in Muswell Hill or Archway and on one occasion Caroline, Vera (daughter of Bill), Laura and Lena ( J's auntie and mother) and their families all met above the shop for a family party (date of this ask J. He was also a steward on the Queen Mary. When did he die ? I remembers Aunt Carrie was with her when he died. J remembers Caroline used to live at 55 Ledbury Road, Bayswater as her grandfather, Jack Akehurst, had a printing business there. Her father lived next door (!). When Jack Akehurst died in 1947, Caroline moved to 41 St Ervans Road, North Kensington, living with Hannah Musgrove in a 2 roomed flat. Caroline slept in the front room while Hannah slept in the back room. CHECK : Did Hannah move to St Ervans Road to be with Caroline or visa versa ? Caroline definitely lived there with her husband in 1911 so seems likely Hannah moved in with her rather than the other way around ? J remembers visiting them there when she was young using the trolley bus. All the graves are in Kensal Green cemetary. 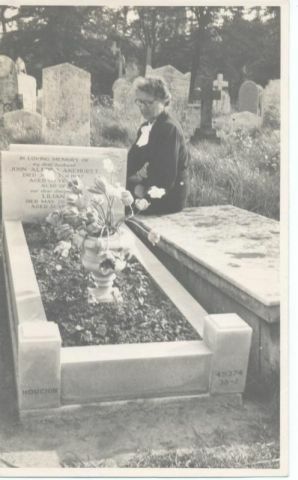 The photo shows Caroline tending the family grave which lies between a headless monument and an angel. Caroline isn't listed on the gravestone despite her ashes being scattered over it because, as you have to pay extra, the family scattered them secretly ! J says Caroline's ashes were scattered over her grandfather's and Lillian's grave. 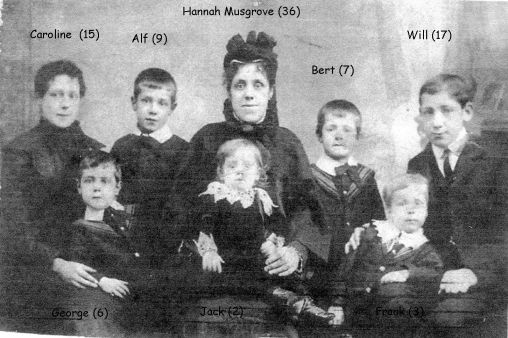 All the old Coopers are there too (grandchildren of Caroline), as are Nellie Lowe's family. My birth mother, I, remembers that Caroline was called Aunt Carrie. She remembers being at her house when war broke out and that Caroline lived with her mother Hannah. She also says Caroline was with her when her father Jack died.